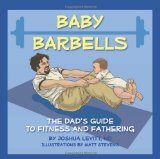 We just received a copy of Baby Barbells, a new book by Joshua Levitt, with illustrations by Matt Stevens. This is an over-sized board book, that explains how dad will be using old muscles in new ways with the arrival of the new baby. Along with the illustrations are some tidbits of wisdom on dads and kids. This is a fun gift for the new dad as a shower gift, and expect him to get a chuckle along with knowing friends as he pages through it. The book does a good job at reinforcing all the new skills and changed habits required to be a good father. On the other hand, don’t go looking for real fitness advice or an excuse to lay off the gym because you’re hefting car seats and strollers all weekend.